So, I'm going to start off with one of the maybe better aspects of the book: the world building. The world building was okay, but not really something that was explored as much as I would have liked. Then again, I'm quite a harsh world building critic, and I have seen a fair few people commenting that they found the world building pretty good, so who knows. In any case, this wasn't really something that was focused on in the book, but there were other things that drew my attention away from this flaw- other, unfortunately, disappointing things. The characters, relationships and romance were among some of these disappointing aspects. I had a lot of difficulty connecting with the characters and really being able to immerse myself in the book. Part of this problem has to do with what I talk about in my next paragraph, but there was also just the simple fact that the characters were very generic and lifeless. Main character Lora's relationship with her best friend Wendy seemed incredibly bland and I honestly feel like I don't understand why the two are best friends. The romance is an underdeveloped love triangle and I didn't feel invested in either of the two sides. The writing was simply one of the worst aspects of the book. It was jarring and clumsy and most definitely the thing that brought down my enjoyment of the book the most. The speech of the main characters was annoyingly formal and clunky and many sentences were phrased in ways that were difficult to read over without stumbling, or cringe inducing, or simply just not something you'd like to see in a book with a young adult protagonist. 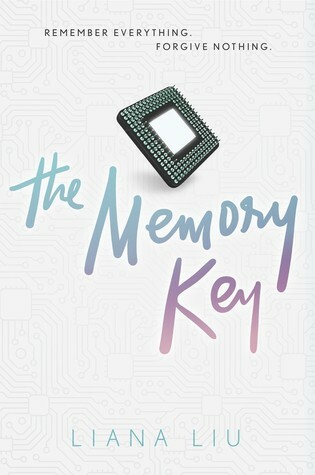 Well, I'm sure you've gathered that this isn't the most positive of reviews, and that's because The Memory Key wasn't exactly something I enjoyed that much. It gets an "okay" rating from me, which is mostly because the premise and basic plot were enough to push the book up from the "didn't like it" range. I have to admit, I struggled through most of the book.